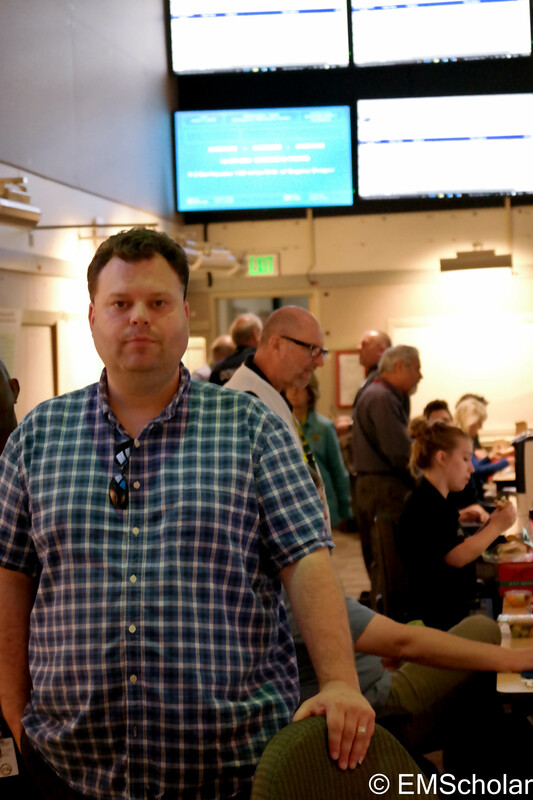 During the first day of the Cascadia Rising Exercise, 2016, the Washington State Emergency Operations Center (SEOC) pretended that it had lost phones and internet. The SEOC floor was quiet and sluggish. People prepped paperwork, anticipating the flood of need when the phone lines came up. A few people were using cell phones and satellite phones to get information about the disaster from the counties (called “situational awareness” or sometimes “ground truth”). Across the hall, the ham radio operators were hunched in close to their speakers trying to distinguish fuzzy connections. These volunteers are part of RACES (rhymes with trees), Radio Amateur Civil Emergency Service which activates to help in an emergency. The “amateur” in their name is a reference to the FCC’s designation of the band of radio waves they use; NOT a reference to their skill level. These guys are pros. 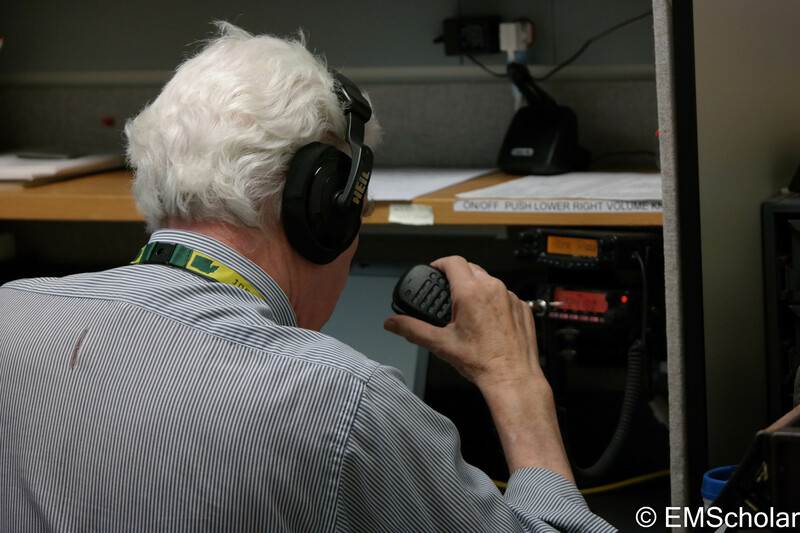 Amateur radio operators set up in a quiet room. 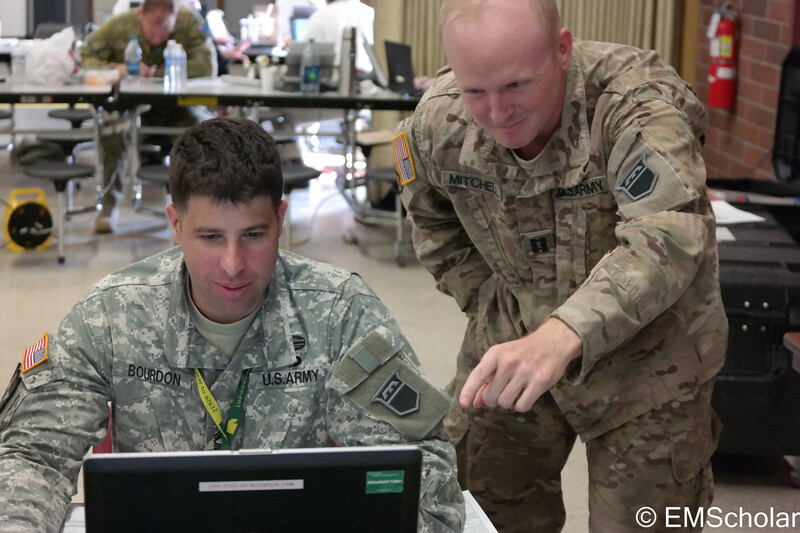 Amateur, or ham operators help the EOC if their phones and email are down. 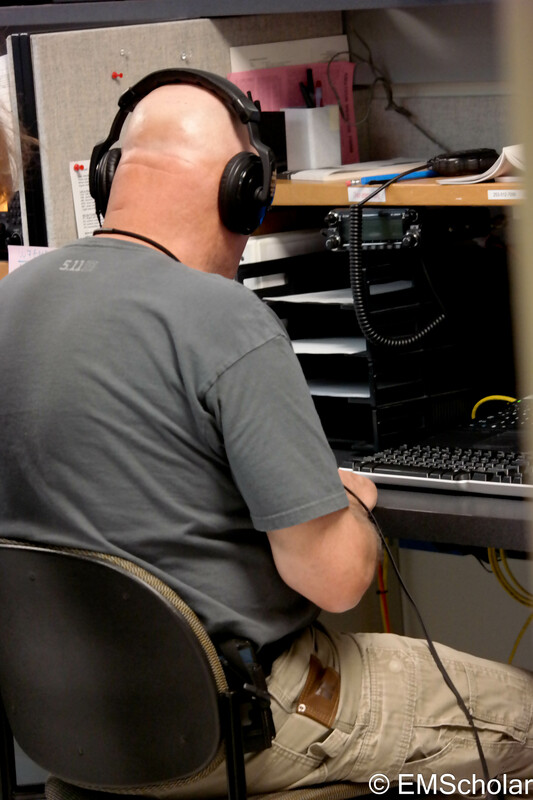 This ham radio operator is trying to reach radio operators in the counties. 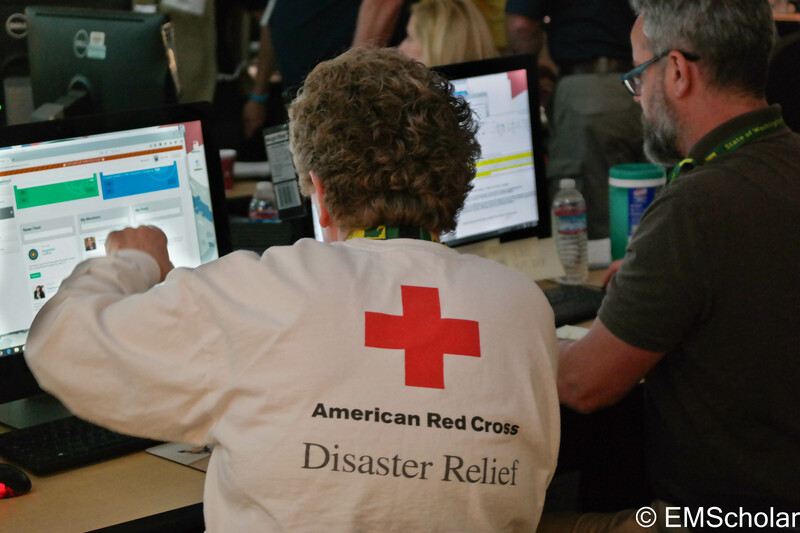 If being without phones and internet is distressful normally, imagine being responsible for disaster response without any way to easily connect to your field teams. That’s why getting coms up is first priority for disaster managers. 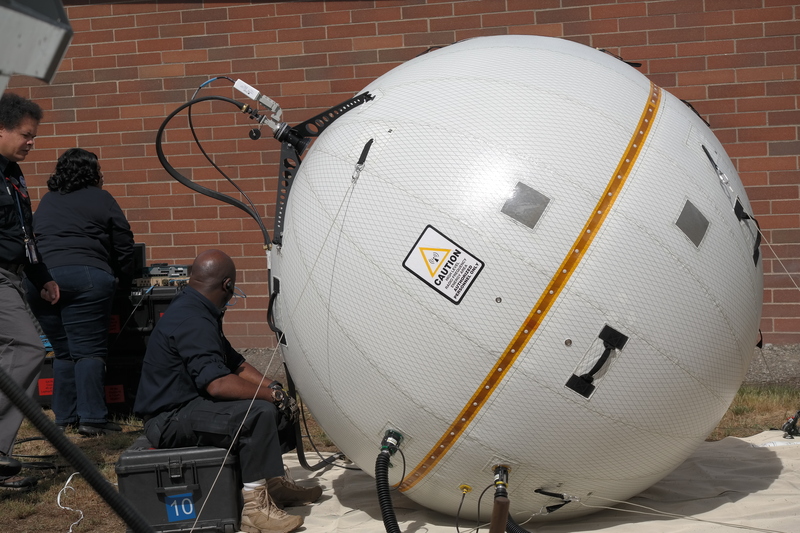 The military (and some civilian companies) have developed ultra-light gear that can be set up for immediate connection. 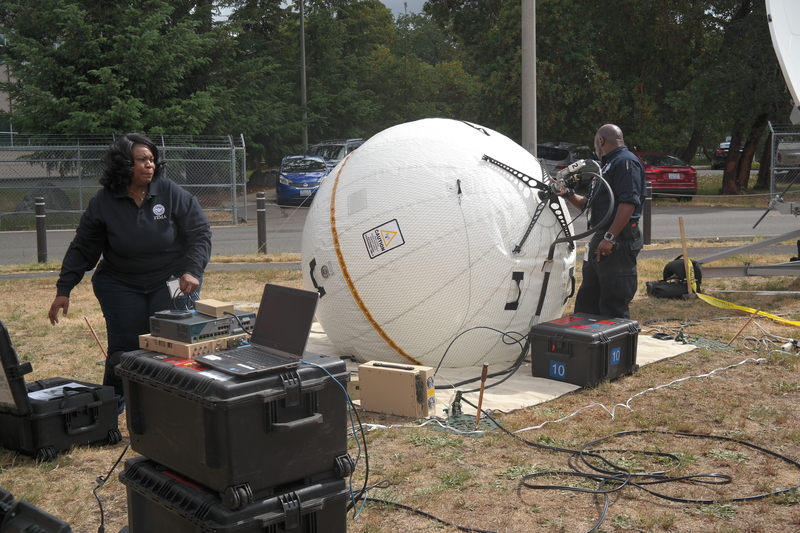 FEMA has brought an inflatable satellite in the shape of a 6 ft white ball. The “dish” itself is merely a reflective fabric on the inside of the ball while the skinny LNB arm juts out of the ball a few inches. 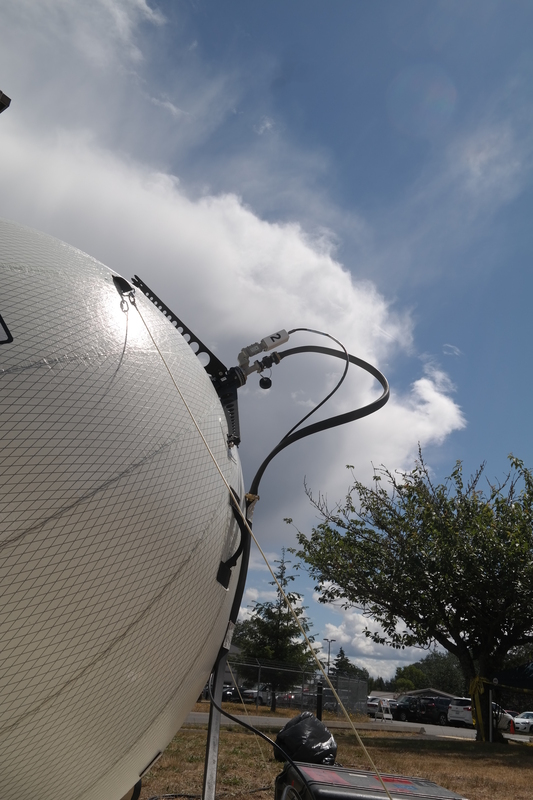 The pressure of the air and the round shape of the ball keeps the dish in the correct parabolic shape while also keeping it at the right focusing distance (according to the manufacturer’s website). The whole thing fits in two to four storage-bin sized chests and can be working in about 6 hours. Most of that time is spent trying to manually find the satellite connection. 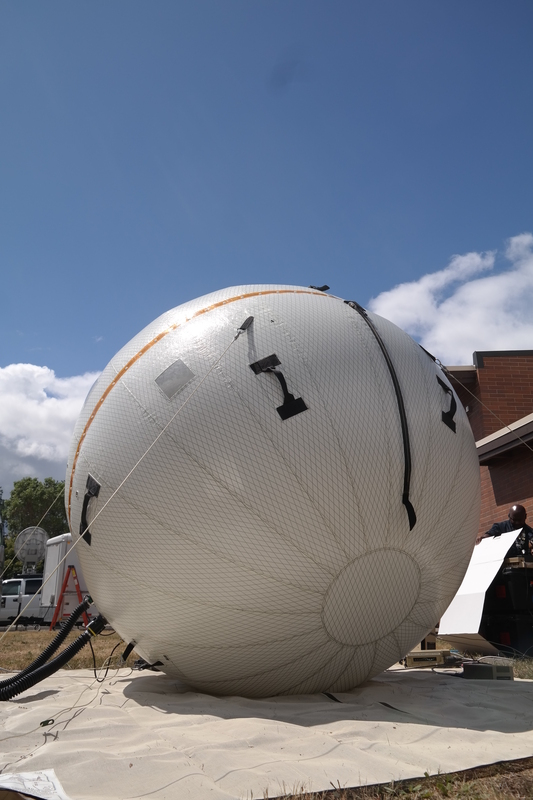 The ball has to be tethered down in 8 spots to keep it from rocking or shifting in the wind. 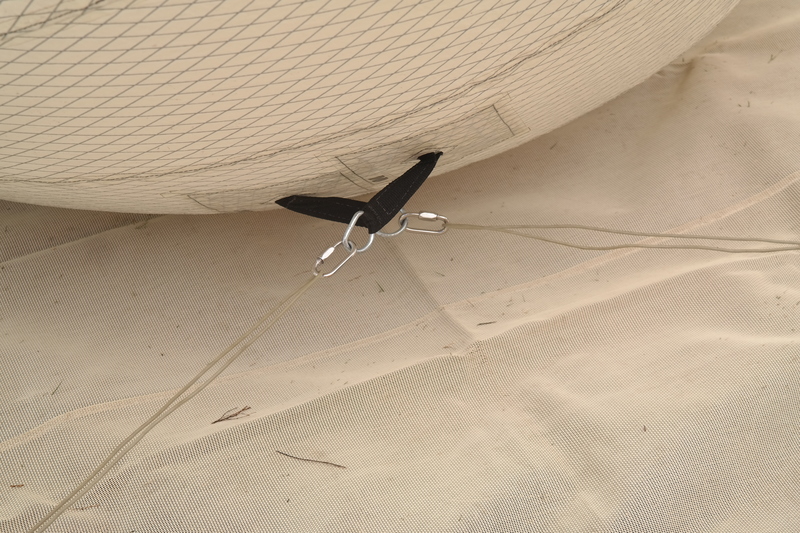 The manufacturer claims that the round shape actually makes it more stable in the wind. Still, one FEMA tech guy admits he far prefers the MERS or Mobile Emergency Response System because the satellites lock automatically. It was probably better before they switched satellite providers, he tells me. Even so, the beach ball can provide cheap high-bandwith to a mobile team fairly quickly and with very light equipment. Ideal for first responders. Theoretically, you could air drop it into impassable areas. Fun fact: Gatr is the name of the company that sells them. The Beachball can fit into 4 small cases and be set up by one or two people. In the lower right, you can see the small laptop and a few cables. All it takes to find a satellite. Some prefer a round mount because you can adjust in two axes at once. The LNB arm is the only external part of the satellite dish. Satellite found. Network provided to emergency personnel. 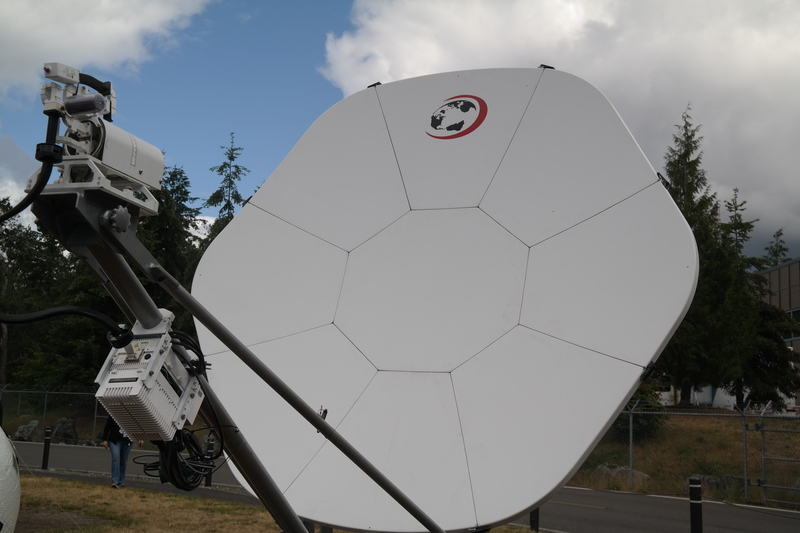 The Portable KU-band Satellite Dish: A bit larger and set up nearby is a portable ground-mounted satellite dish. It takes a bit longer to set up and fits in twice as many cases. But seems to serve a few more people. The larger, stiff dish fits in many more cases and gets put on a trailer. The MERS that the FEMA tech prefers is a small camper with a satellite dish on top. Inside is all the telecommunications equipment you might want: VOIP (internet phones), wifi, radios, and video/audio equipment. A tiny conference table in the middle seats 4 with more work spaces along the counter. The truck can provide 40 people in a building nearby with phone or internet or provide 10 people working in the truck with phones AND internet. 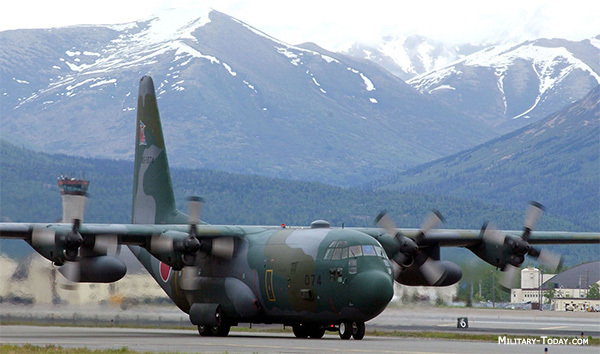 The truck can be loaded onto a Boeing-137 or C-5 plane for transport into disaster areas. While it is more stable and a little more powerful, it also requires cleared roads. The military has a similar vehicle (see second left). Pretty nice conferencing system inside. and a few work spaces. A Sprint truck deploys in the Cascadia Rising Exercise. 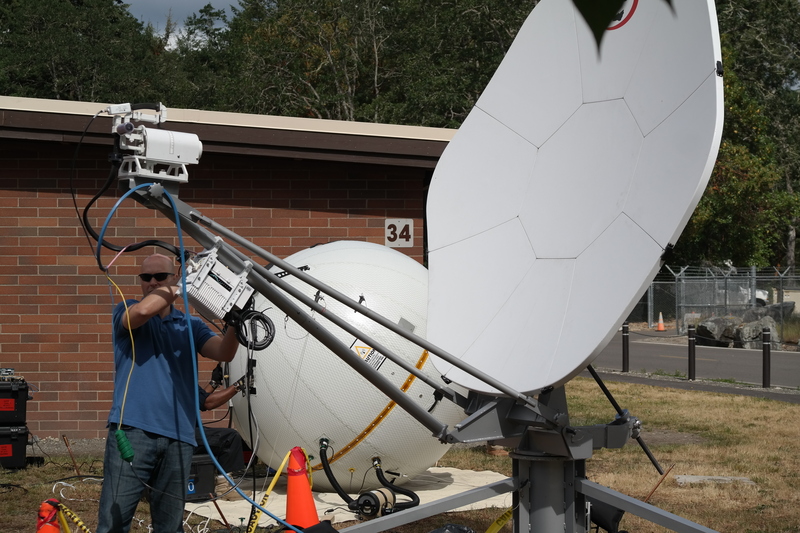 Many cell service providers routinely practice with disaster personnel. Of the same size as the MERS are a variety of “cell on light trucks”. 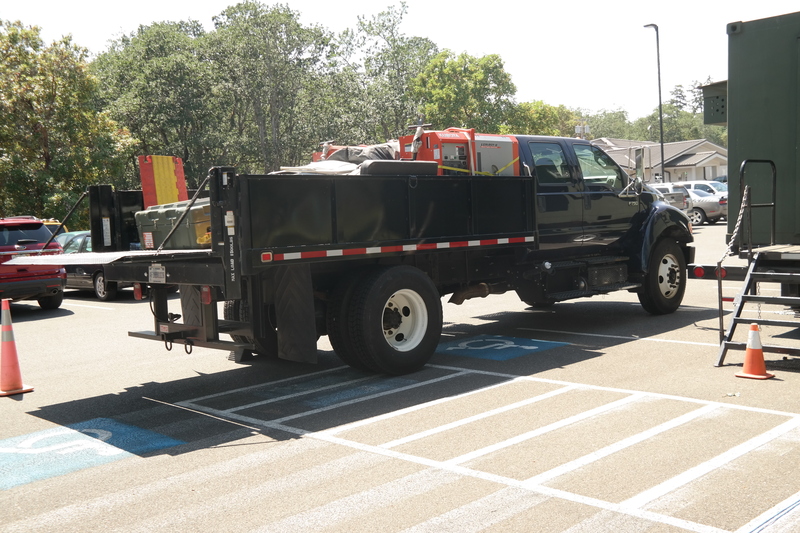 All the cell providers have mobile teams who deploy to disaster zones with these trucks in order to re-establish cell service while their permanent cell towers are being fixed. The truck deploys a 70 ft antenna and a satellite dish supported by a generator that can run for 1-2 weeks depending on how hot it is. The equipment inside the truck needs to be kept cool, so much of the generator fuel is used for that. The truck can support about 600 simultaneous users which is about the capability of a regular cell tower. Also, many of the the cell providers–according to Sprint–bring phones to the disaster area. They can pre-load contacts and provide them to field agents who can then use them to edit and share maps, communicate with search and rescue personnel, send and receive email, etc. The best of the best is spelled JISCC. The Joint Incident Site Communications Capability. The JISCC (rhymes with wisk) is run by the National Guard and represents the pinnacle of ability. It was the spidery JISCC antenna that I had spotted deployed on a strip of land and which piqued my curiosity. I felt especially honored and grateful to be given a guided tour of the whole operation (special thanks to a major who wishes to remain anonymous who gave me over an hour of his time). Unfortunately, I was only able to get photos of the outside of the JISCC. I will do my best to describe the inside. The JISCC does everything. Twice. First, I was shown a tiny closet where a young airman hunched over a box with 6 inch screen in the lid and buttons and wires all inside it. That grainy picture, I was told, was the feed from the helicopter flying over the (pretend) disaster area. The National Guard command was working with the state to get visuals of different areas to guide search and rescue or assess damage. The JISCC was helping to collect that video. The helicopter camera was equipped with infrared so that we could use it at night. Next, I was shown the main room where about 6 Guardsman (not including the lonely airman in the closet) worked on folding tables next to racks of equipment in a very cool room. In one corner was a chest high cabinet of radios. All kinds of radios: HF, VHF, UHF. The radios have cross-band repeaters for better range. Two guardsmen fiddled with dials trying to clear up the signal from the Puget Sound area. The radios can also talk to cell phones. Handy, I think. You can even send email over the radio, he tells me. I look dubiously at him. It sounds like a fax, he says, and on the other end, you have a computer which translates it into words again for you. 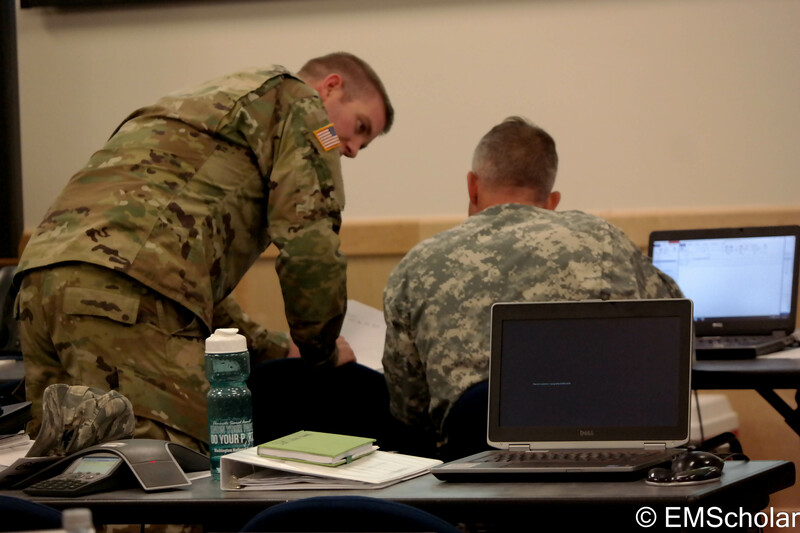 This is one kind of interoperability that the National Guard strives for: communication between different kinds of technology. On the wall to the left was a bank of routers for phones and computers. The JISCC brings light laptops and other equipment so you could conceivably talk to anyone on anything. Outside, it’s 90 degrees; uncomfortably hot for us northwesterners. That’s one of the benefits of working in the JISCC, my guide says, laughing. The equipment has to stay cool, so you stay cool too. We walk over to a cordoned off area and he points out the antenna one by one. Front: the antenna receives helicopter feed for the National Guard. Back right: the pole supports thin wires which collect HF radio waves. The stico (named after it’s manufacturer) is an interoperable RF antenna. There’s also a VHF/UHF antenna, and a satellite dish which automatically finds the satellite. It’s point and shoot, he says. Just set it and go. The especially tall one with the funny spikes is the antenna receiving the helicopter feed. Next to it is a pole with wires attached to a tree and the ground. The wires are the antenna, he tells me, not the pole like you might think. It receives HF radio and this design makes it extremely light and packable. A few steps away is the trailer and truck that all this goes on. It’s surprisingly small. In the field, the trailer can be set up with all the radio and router equipment from inside and air conditioned to keep it cool. I see a few fold-up chairs left in the truck. The whole thing can be loaded onto a C-130 and only needs a 6 person team. They’re currently thinking about ways the equipment can be air-dropped to affected areas. The only trouble is: if they drop it and wheels can’t get to it, then you’re stuck. And if wheels could get to it, why would you need to drop it? All the JISCC equipment fits in this trailer and truck. All the equipment can be offloaded by hand. The back of the truck has a lift that takes crates to the ground for you. The whole thing can drive onto this C-130. My guide recalled how the National Guard JISCC team was called up last summer during the fires. The fireman had brought their own equipment to their base camp (an actual campground) but discovered that they were stuck in a valley. Their line-of -site satellite phones and radios didn’t work. They needed the National Guard’s communications support. They also found that having email and a fax machine on base was extremely helpful for organizing firefighter schedules and payment. “What’s the one thing you wish you could tell people.” I asked him. He paused squinting into the bright, unblemished sky. “We provide communication capability to people who are coming to help you,” he replied. As I walked back toward the cool, dark of the SEOC, I couldn’t help but be very grateful to the engineers, IT guys, and other geeky types who designed, ran, and maintained this equipment. 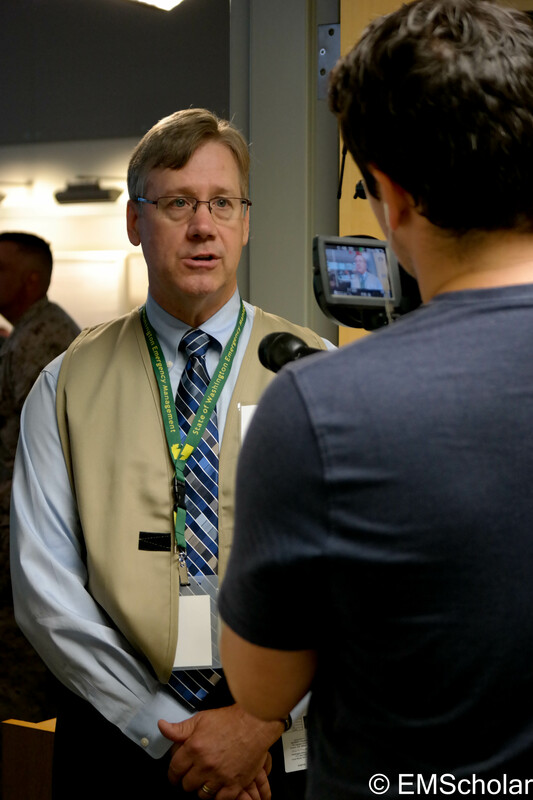 From the individual volunteer HAM operators, to the portable satellites, the heavier MERS teams, and private cell trucks, to the wonderfully robust National Guard JISCC: all are important pieces to the response network. We couldn’t do it without them. This is a fictionalized account of a day in the State Emergency Operation’s Center during a pretend earthquake/tsunami disaster. This account is not real and should not be panicked about. 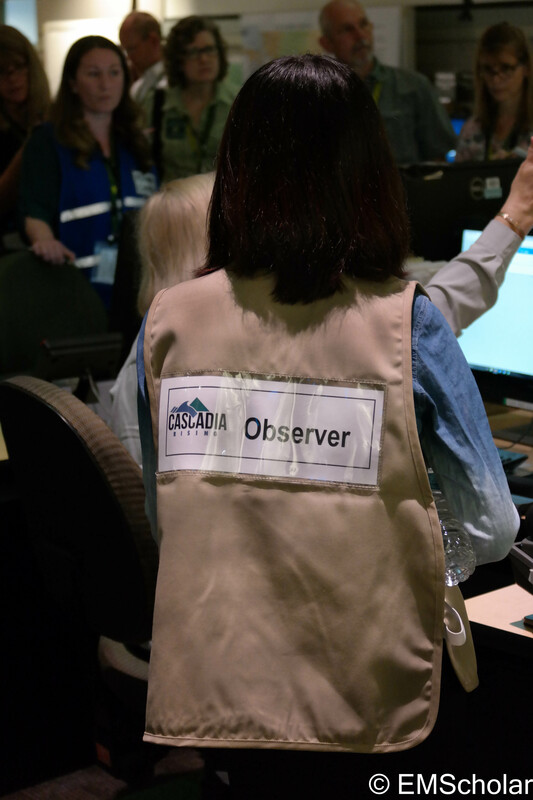 For background information, please do see our previous blogs about the Cascadia Rising Exercise, 2016. While I was participating in the exercise, I found it difficult to describe the work happening around me to friends. There are so many little pieces to keep track of and so many vague abbreviations and tasks to do. I thought a fictionalized “day in the life” might be both helpful and fun. This is a pretend day two when the responders have a good sense of the tasks before them, but still have a lot to do. Federal agents are on the scene and communications have been re-established so work is in full swing. 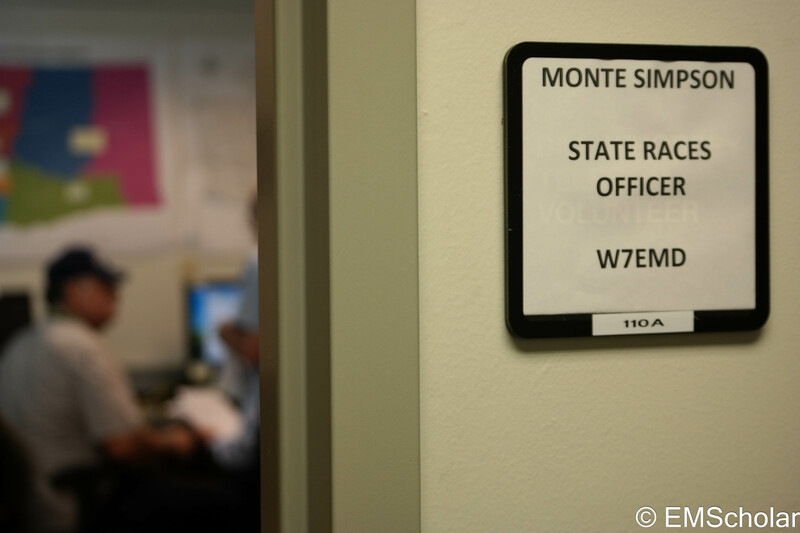 I chose this day so that you can see the very wide variety and scope of problems that the State EOC had to deal with and the many different people helping. The meeting schedule is taken from several real meeting schedules that Cascadia Rising used though some things were edited for clarity and for drama. 7:30 am: Shift Change Briefing. All state Emergency Operations Center (EOC) staff attend a meeting for getting updated on the disaster. Editor’s Note: For the Cascadia Rising Exercise, the night shift was “notional” which means it only existed on paper. Controllers delivered “injects” or pre-conceived, pretend-facts that the players have to respond to. Last night, there was an aftershock and several gas lines lit fires. 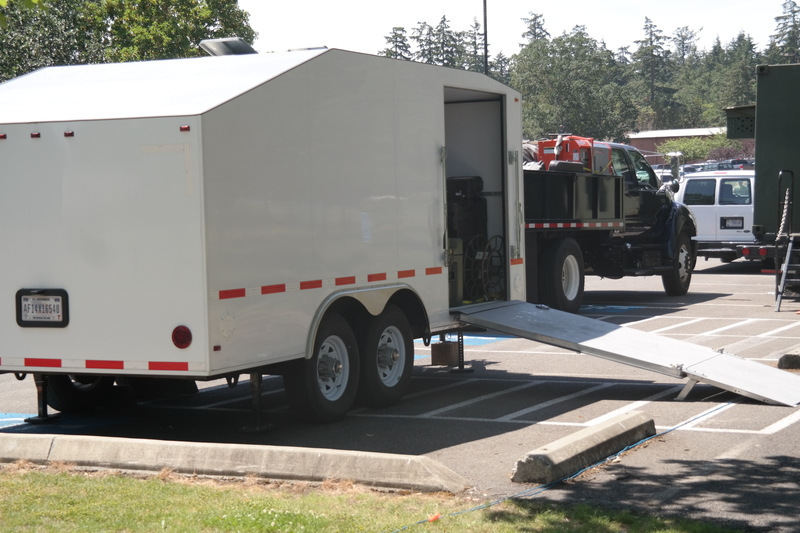 Pierce county needs fire trucks and state EOC employees are working to see who can supply them. Maybe the Department of Natural Resources? How about the National Guard? He describes the updated situation and gives the objectives for the day. 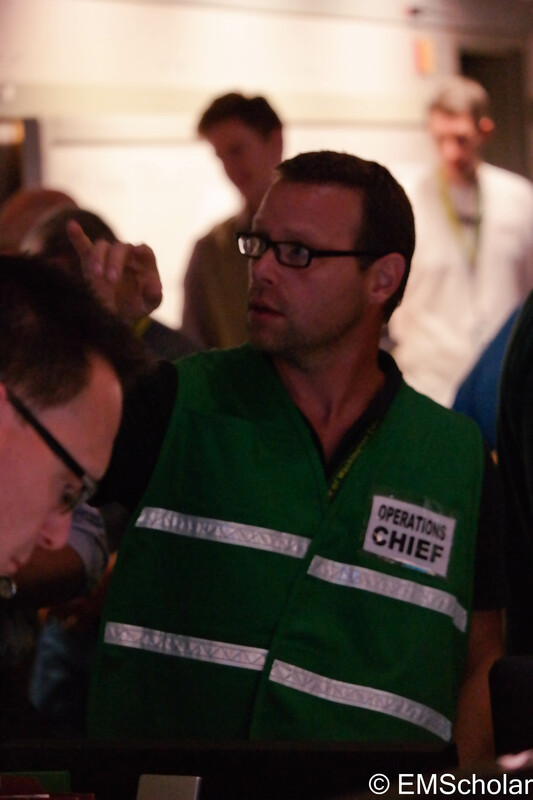 The EOC section chiefs organize their staff in response to the objectives. 8:30 am: Unified Coordination Group (UCG) Objectives Meeting. “Review and identify incident objectives for the next operational period.” Planning staff from all levels and branches of the government meet to discuss tomorrows priorities while operations staff work on today’s priorities. Today we’re working on search and rescue, fire suppression establishing shelters, and assessing the damage to “critical infrastructure” like hospitals and police stations. Tomorrow, we should work on road clearing, getting fuel to vehicles in the field, getting the power grid back up, and sending food and water to shelters. The operations staff meet to discuss today’s priorities called “objectives”. (They were approved last night by the planning staff). 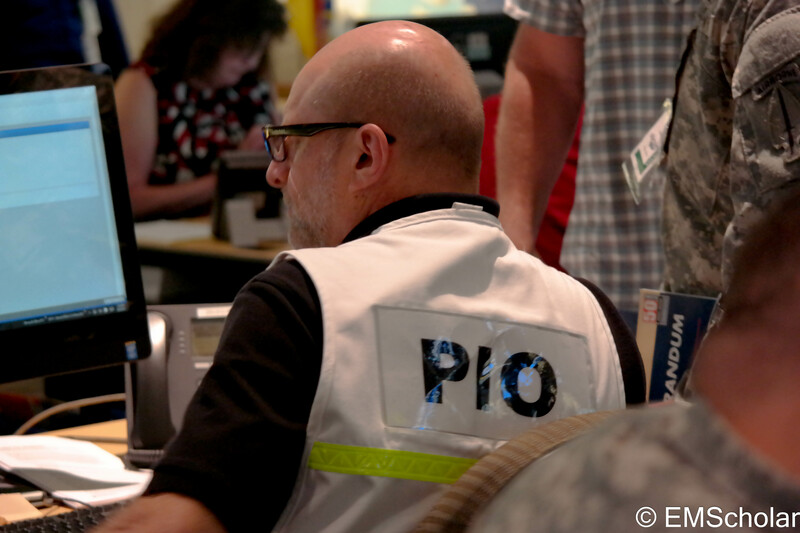 The EOC supervisor briefs his Operations Chiefs and the Disaster Manager who will later need to liaise with the planning staff and politicians. 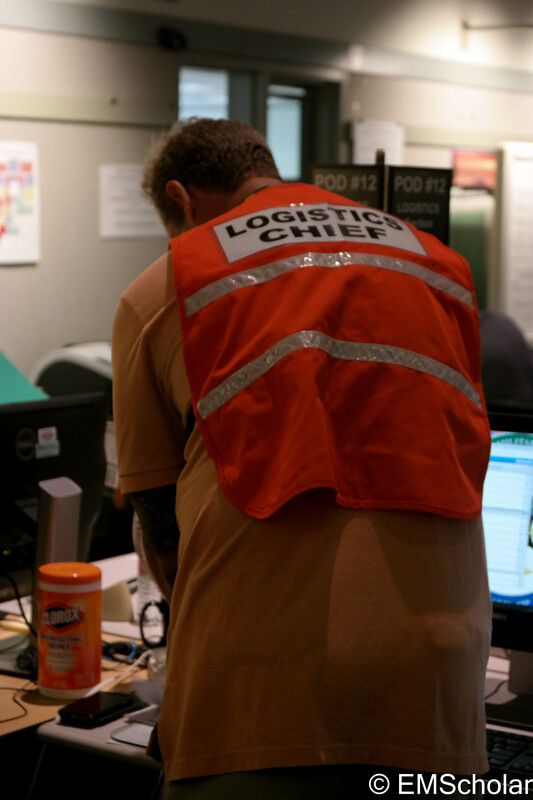 Today, we’re working on search and rescue, mass care (medical care, housing, etc), damage assessment, fire suppression, road clearing, fuel line and power grid repairs, and body collection and identification. The operation’s staff are tracking more than 100 requests for help from the counties and tribes. FEMA arrives with their own communications equipment. The Disaster Manager and other officials meet to decide whether this emergency is bad enough to warrant an official Disaster Declaration request by the governor. It is. In fact, the President has anticipated this and is standing by to grant the request immediately. The EOC is relieved to hear that they have received a Presidential Disaster Declaration. Now they can easily receive Federal aid. 9:15 am: The Media Arrive: They want to know about the disaster declaration and the status of the response. 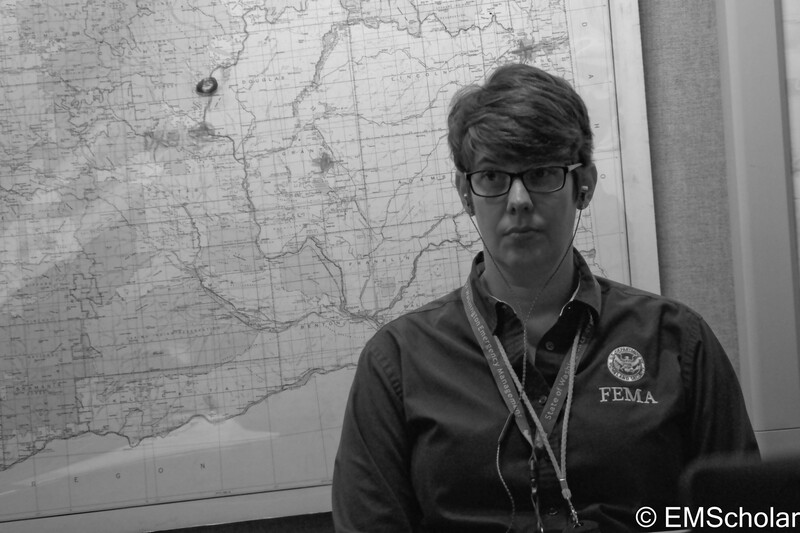 They work closely with the SEOC to get important life-saving messages out to the people. 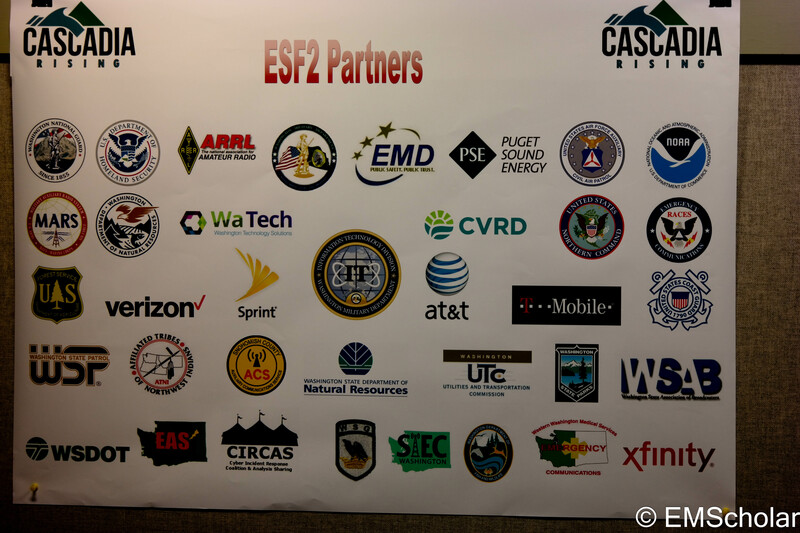 Fun Fact: The media really did come into the SEOC during Cascadia Rising. 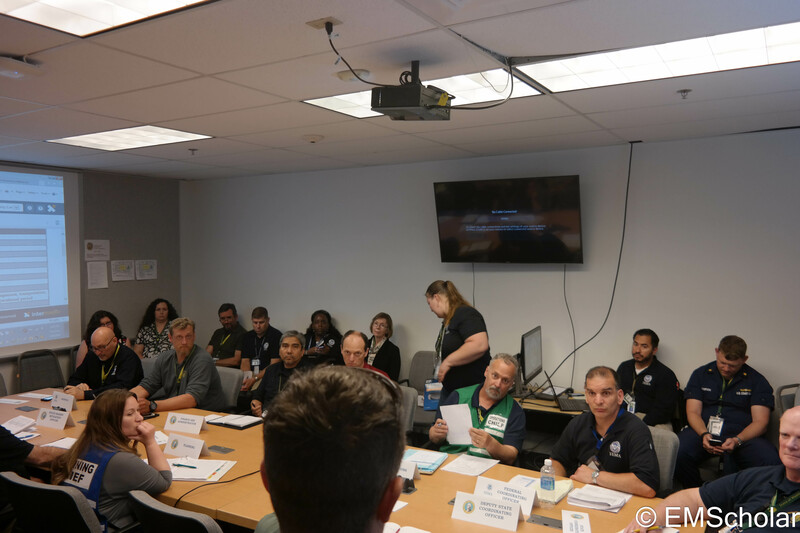 The Governor did a pretend news briefing, and then the cameras came into the SEOC to interview the FEMA Region 10 Director and the Lead Controller about the exercise itself. The media is an important link for getting life-saving information to the public. 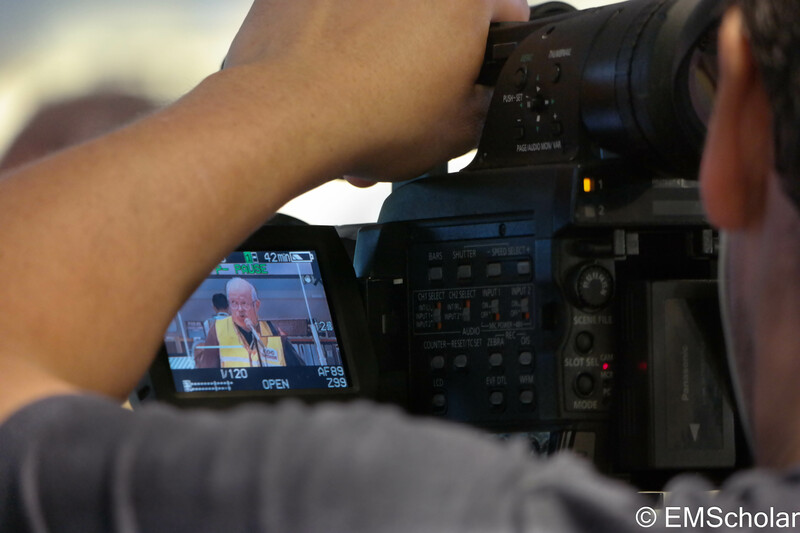 This cameraman is getting b-roll of the SEOC floor supervisor running the general staff meeting. Lead Controller, Lit Dudley, talks about the exercise. 9:30 am: Fuel Task Force Meeting: How many lines are broken? How can we fix them?Who needs the fuel? How can we get them fuel for emergency use? 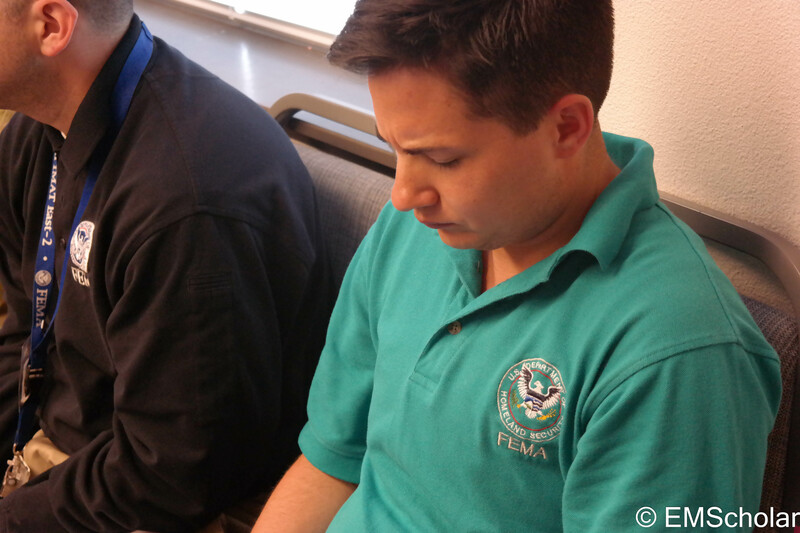 9:30 am: FEMA National Call: FEMA field agents meet with their national headquarters, military officials, and state officials via teleconferencing equipment. They compare notes and discuss resource requests. For instance, can the military let us use some helicopters for search and rescue operations, and some planes for fire suppression? 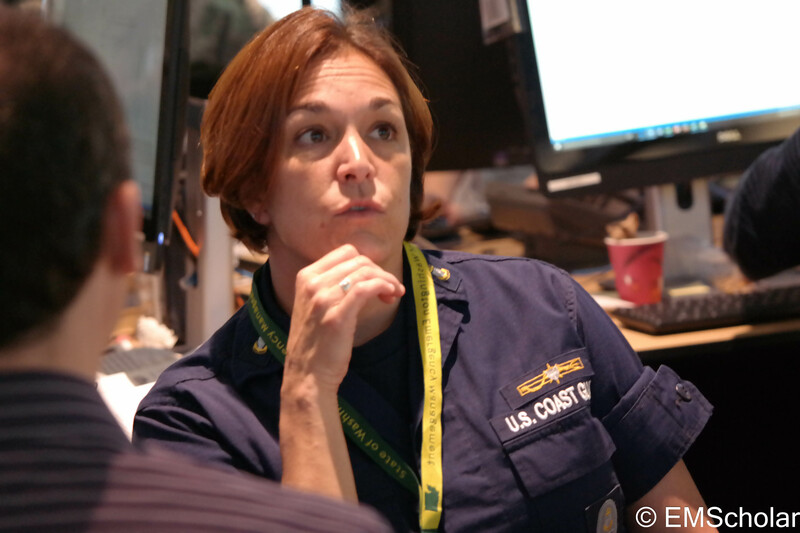 FEMA coordinates with the military and Federal government to provide support to the state. Public Information Officers from FEMA, the state, the tribes, and counties, meet to discuss what to tell the public. People are beginning to ask what to do with the bodies they’ve discovered. What can we tell people about when power will be back up? The State EOC floor listens to the local jurisdictions on speaker. The conference call is piped in over the speakers onto the EOC floor. The EOC floor supervisor takes role call. Most of the counties have joined the call. One by one, they describe their needs and their own response activities. 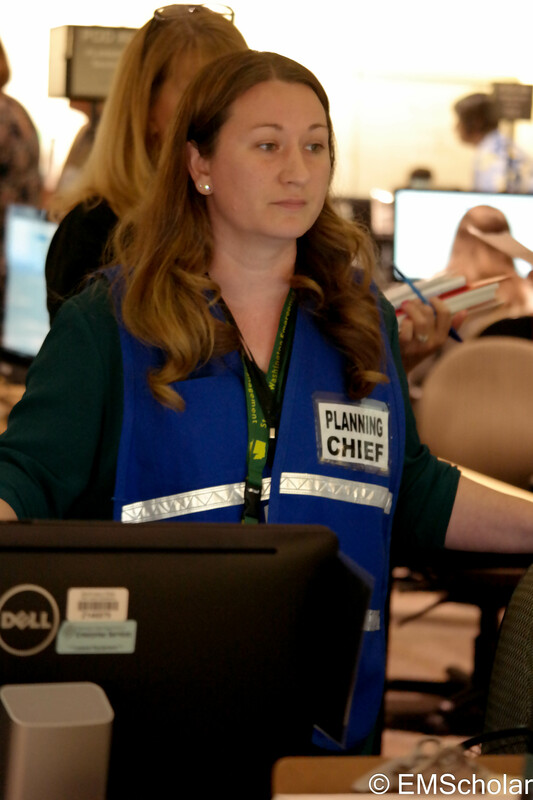 The King County emergency operation’s center had to move to their secondary site due to damage to their building. They give the group their new address and phone number. Klallam tribe has opened their casino and hotels as a shelter. Thurston county is stranded. Both Hwy 101 and the Nisqually bridge are damaged. The State asks the Army Corps of Engineers to see if they can fix the bridge and/or clear Hwy 101. 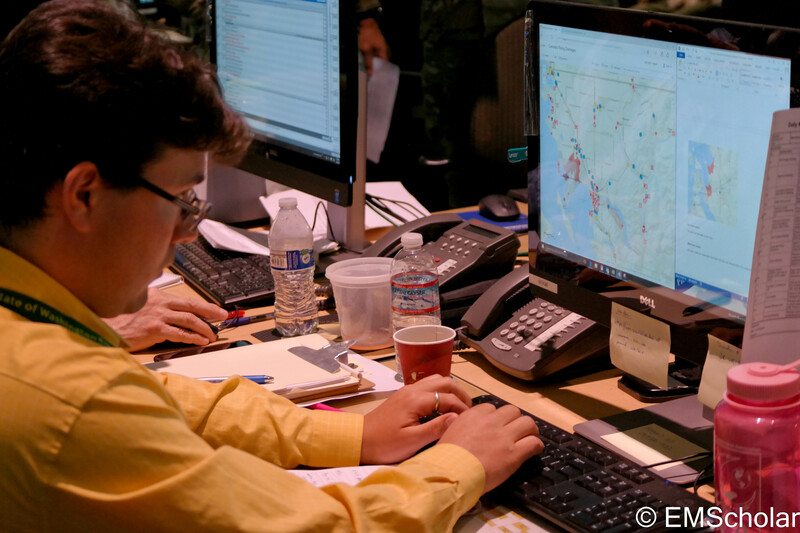 The task force members meet to update the incident map with damaged buildings, ports, and roads. They begin to prioritize needs. If we can fix some ports in Puget Sound, a navy vessel can bring supplies up from California. It might be faster than trying to clear enough roads to get trucks through. The fuel-line fires are threatening some fueling stations. US Army Corps of Engineers, Environmental Protection Agency, Natural Resources Conservation Service (NRCS), US Coast Guard, Department of Transit, and Department of Ecology and others meet to discuss clearing roads and power lines. 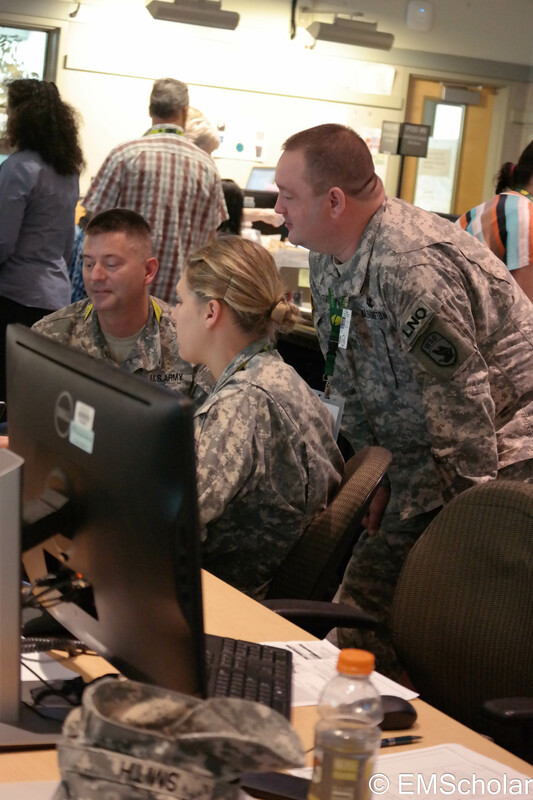 The National Guard uses the critical infrastructure damage data to prioritize debris removal. The Army Corps of Engineers sends crews to help. Active military personnel support with helicopters, heavy trucks, and other specialized equipment. The Mass Care Taskforce needs to know more about which hospitals are functional, how many shelters should be set up, and to hear about what local jurisdictions need. Klallam tribe’s shelter is beginning to receive evacuees with pets. What should we do with them? The Red Cross is starting a blood drive and the Salvation Army is beginning to process donations. The Mass Care Taskforce helps decide where to put shelters. 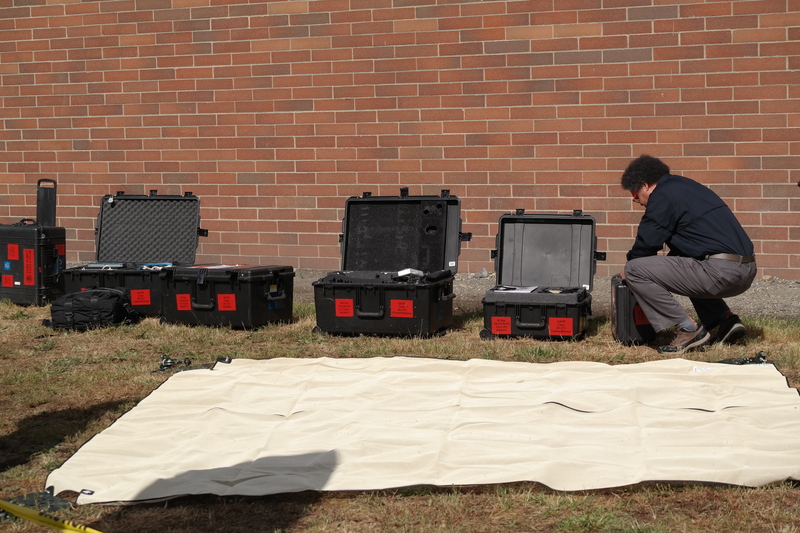 They work with private agencies to supply shelters and hospitals. They find a quiet room to work in. 11:30 pm: Lunch is served by building support staff. 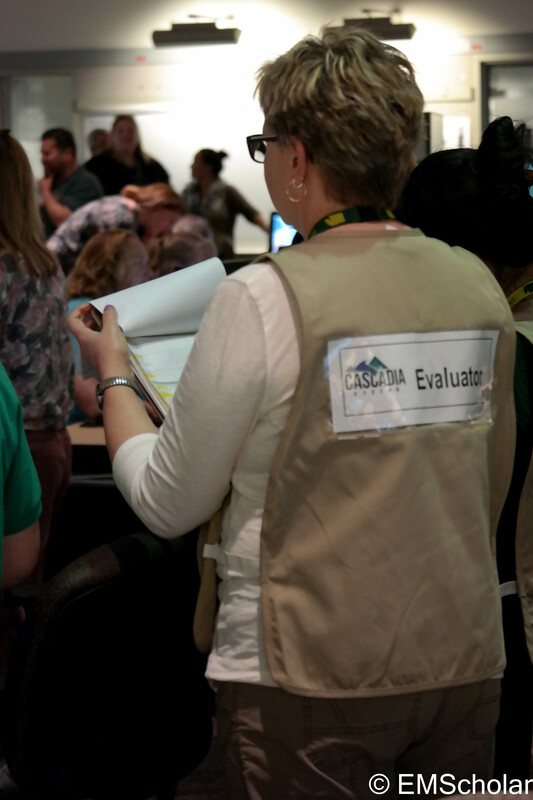 The State EOC operations staff have been tracking requests and make recommendations for tomorrow’s objectives. The various taskforces have recommendations too. The State EOC staff pause to get on the same page with one another. The state meteorologist gives a forecast. Incoming rain is good news for fire suppression but bad news for mass care shelters. They might need more tarps. The Public Information Officer finally gets an answer from the Department of Health about what to tell survivors about how to handle bodies. The Department of Ecology need hazmat teams to assess oil spills in the area. 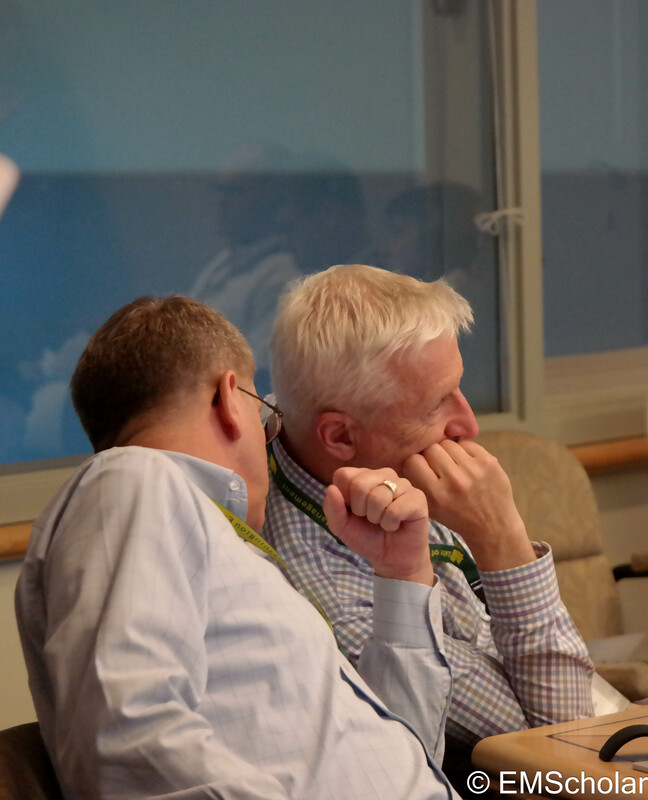 The Disaster Manager listens in to the SEOC briefing. The Disaster Manager will take this information to elected officials and others. 1:30 pm: Oil and Hazmat Coordination Group. 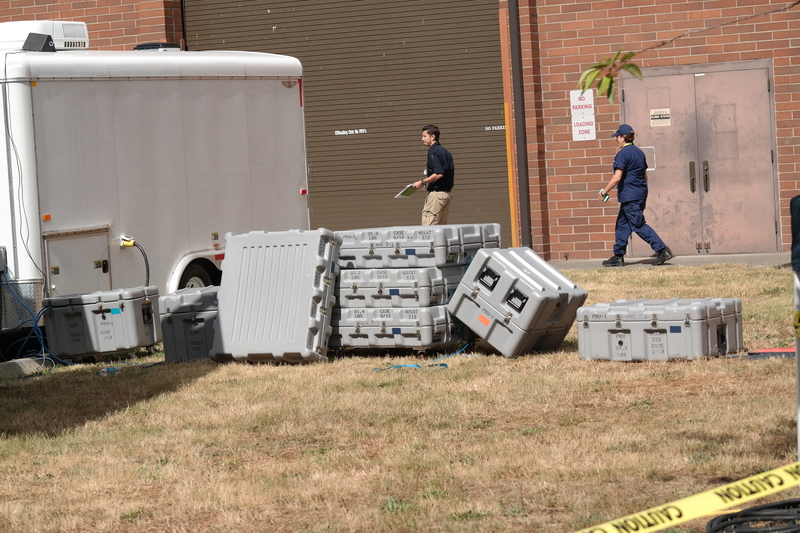 US Coast Guard, the Environmental Protection Agency, State Department of Natural Resources, and State Department of Ecology meet to coordinate hazmat work. 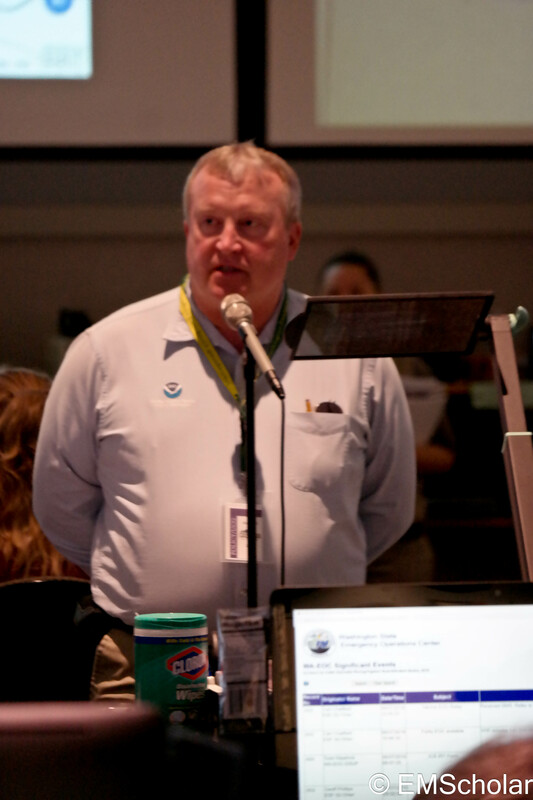 Disaster Manager and others call Washington, Oregon, Idaho, congressional delegations and other Federal partners to give an update of the situation. One Washington state congresswoman is concerned about the damage to agriculture. 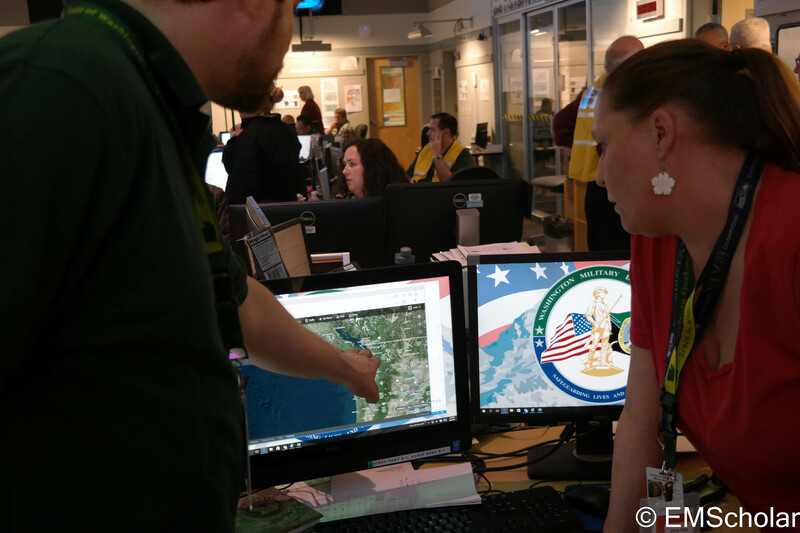 Even though it’s very early in the response, the EOC staff do their best to give some projections to the congresswoman so she can prepare to help her constituents during long-term recovery. 2:30 pm: Power Task Force Meeting review and update strategies for getting the power back on. 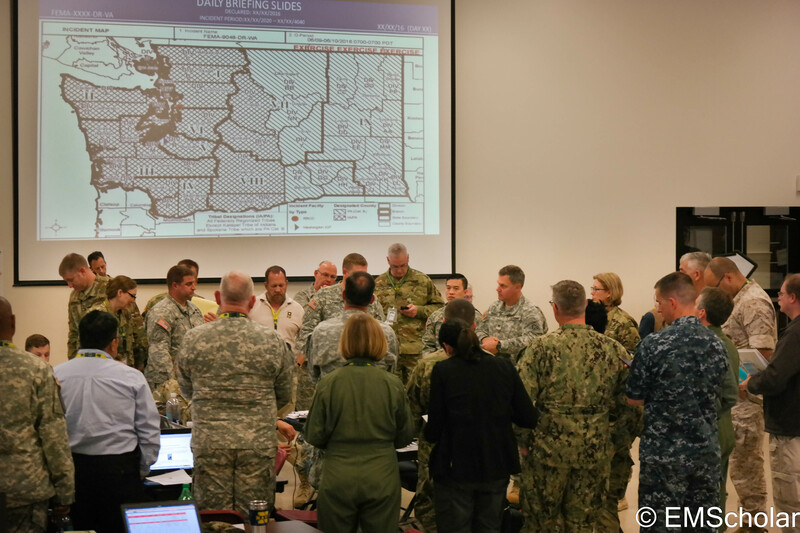 Section chiefs, the State EOC supervisor, representatives from FEMA, the National Guard, and Northern Command (active duty military), meet to discuss tomorrow’s priorities. It takes a long time; there are many task assignments. A list of firefighting resources and contact info is added to the Joint Incident Action Plan. A last minute addition: Pierce county jail needs water and extra patrol. The Tactics Meeting is extremely crowded. They’ve had to move rooms several times. FEMA-state liasons make sure nothing is being forgotten or doubled up. Planners deliberate on priorities for tomorrow. 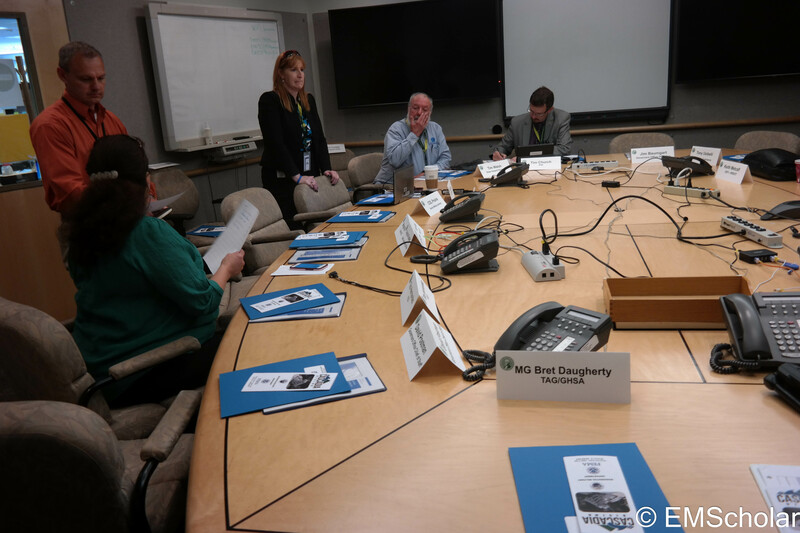 The Emergency Management Division Director, Disaster Manager, and agency executives meet to discuss incident status, policy issues, and strategic messaging. Coordinating officers (liaisons) meet to make sure inter-agency coordination is going well. Some state staff are having trouble using the FEMA request form. Emergency Management Division Director, Disaster Manager, and the policy group, give an incident update to the Governor’s Chief of Staff and other elected officials. The Disaster Manager with others updates elected officials. Everyone takes a look at the Joint Incident Action Plan which is a document with all the objectives that the Tactics Meeting approved, assignment lists for tomorrow, contact information, maps, and tomorrow’s meeting schedule. When it’s approved, the document get’s uploaded to the State and FEMA’s online sharing environment where it will guide tomorrow’s work. The SEOC goes through tons of coffee. Thousands of local, state, and federal staff including many branches of the military have worked all day (and night) to save lives and property. And they’ll do it again tomorrow. This is a dramatized account of a day in the State Emergency Operation’s Center during a pretend earthquake/tsunami disaster. This account is not real and should not be panicked about. Here is only a very small sampling of the 20,000 participants spread across three states and federal and military headquarters. 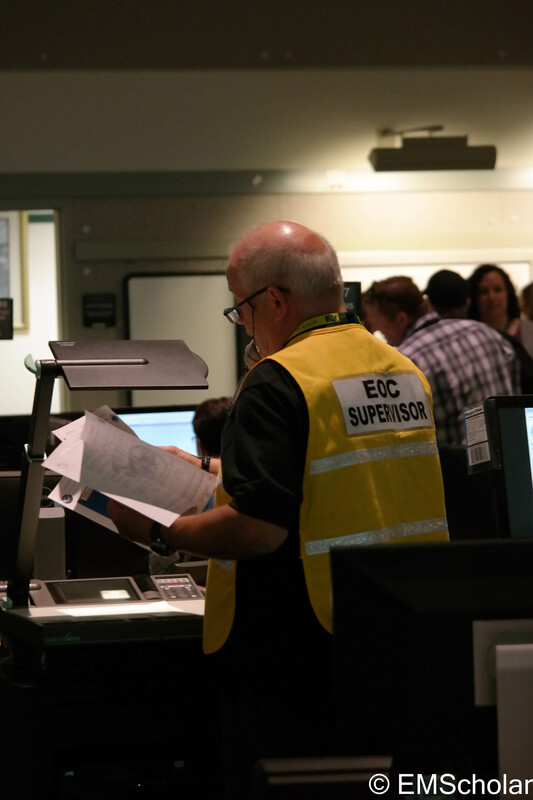 These people were found in the Washington State Emergency Operations Center (EOC) and the surrounding campus. Mouse over the pictures to see more. 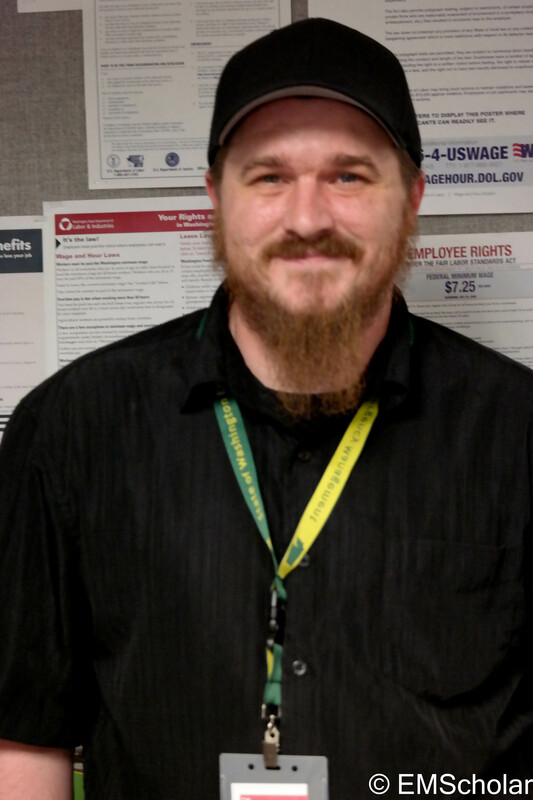 EOC Supervisor keeps the EOC floor running smoothly. The state meteorologist keeps the EOC up to date on the weather which might affect sheltering or fire suppression. 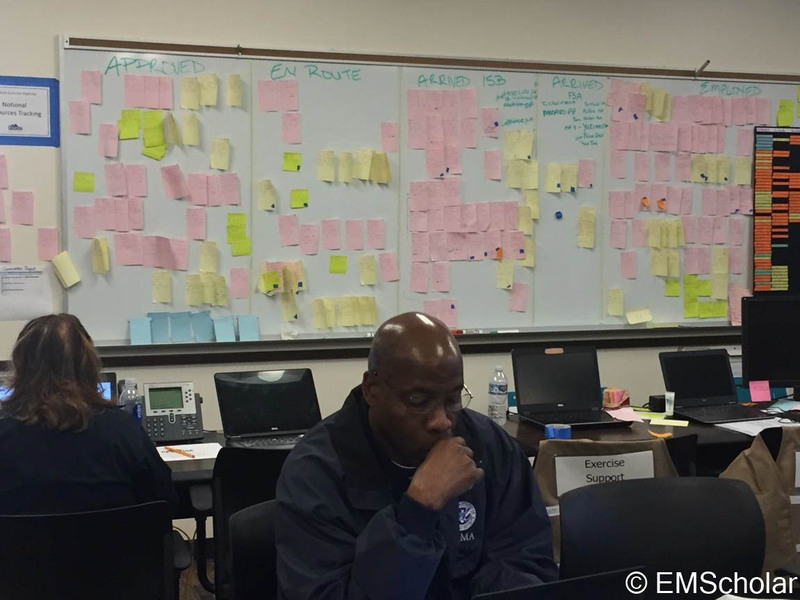 Planning organizes the EOC’s next steps. 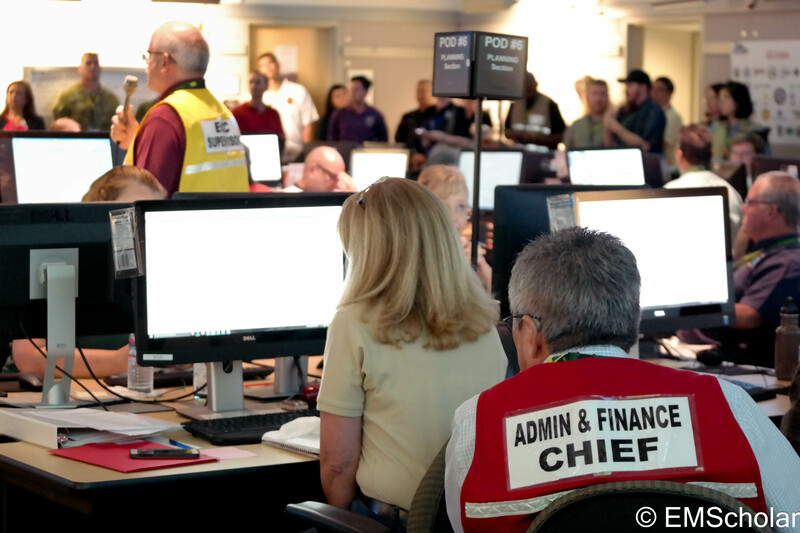 Admin & Finance handle staffing issues within the EOC and track expenses for after the disaster. 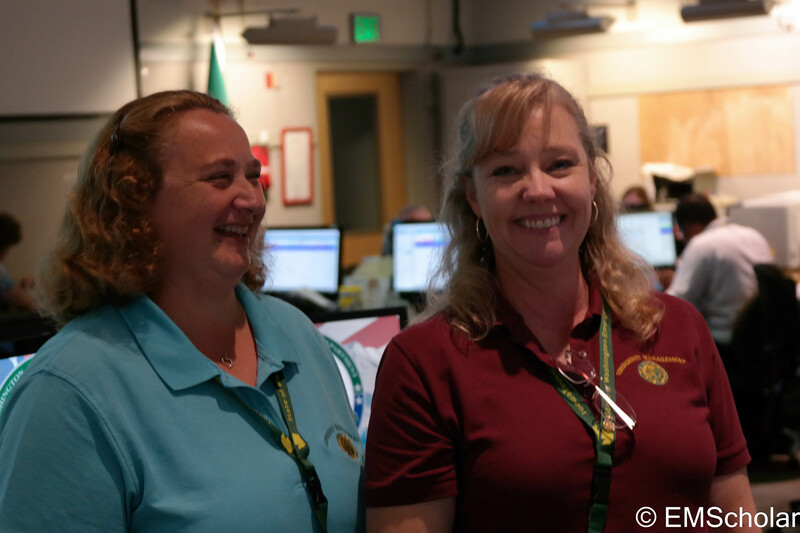 Deborah Henderson (left) and Zoe Choate (right) schedule staff so that the EOC always runs smoothly. Public Information Officer directs external relations staff to provide information to the public. Joe Benei from IT helps to maintain the EOC computers, audio/visual and conferencing equipment. Lots of players are participating in the exercise. Here’s a few. 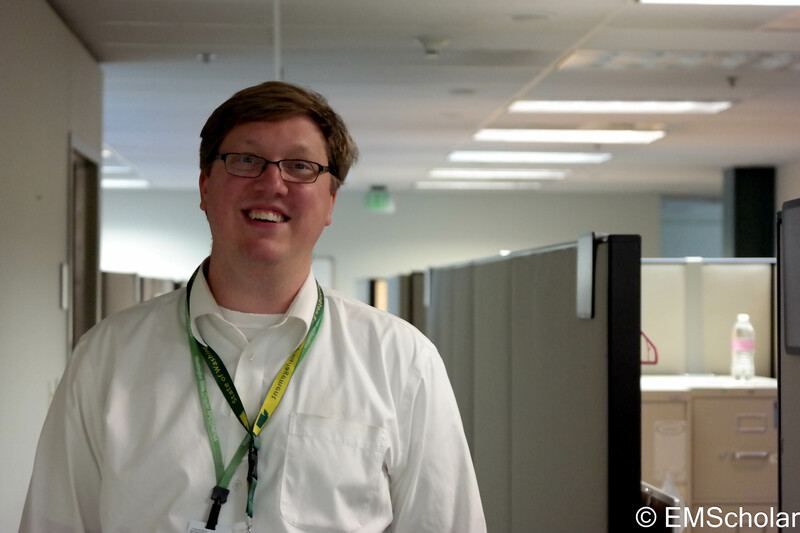 Steven Friedrich helps to draft news releases and monitor/respond to social media sites. 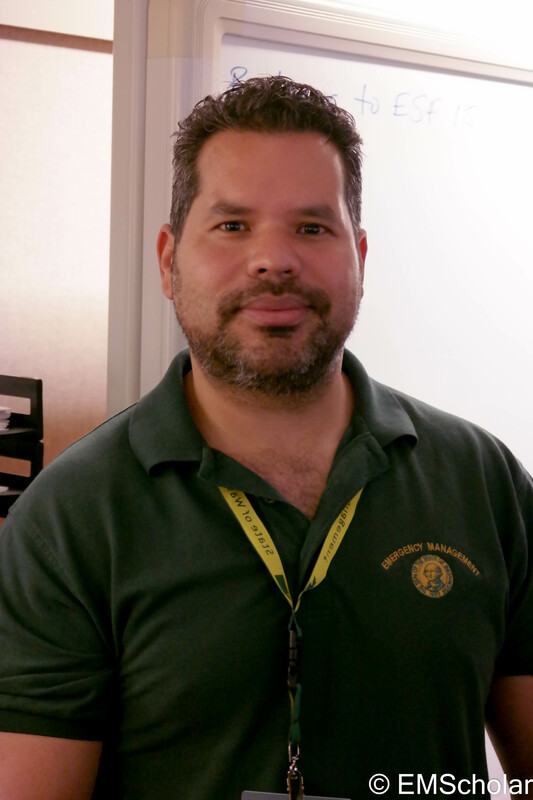 Rafael Estevez work closely with communications and command staff to translate messages for the public. He knows Spanish, Arabic, Korean, and American Sign Language. 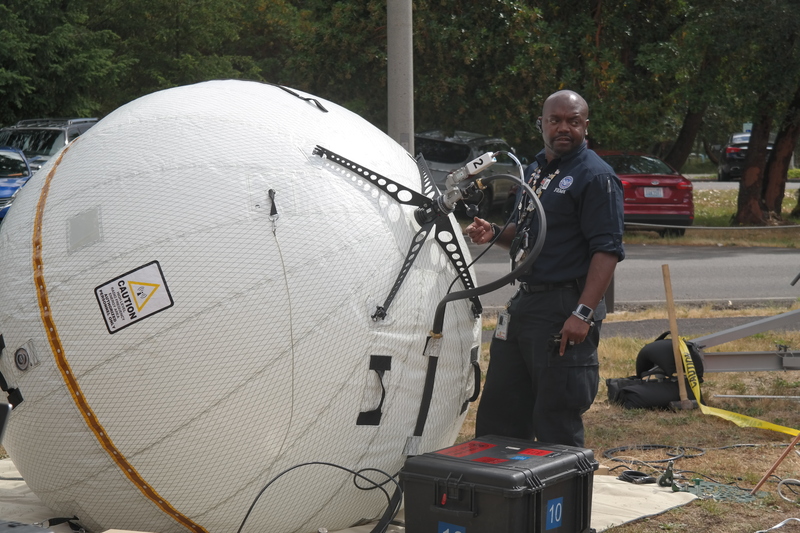 Wireless carriers deploy quick response trucks to reestablish cellular coverage. GIS map makers update the EOC map with reported damages like broken fuel pipes, unpassable roads, collapsed bridges, etc. 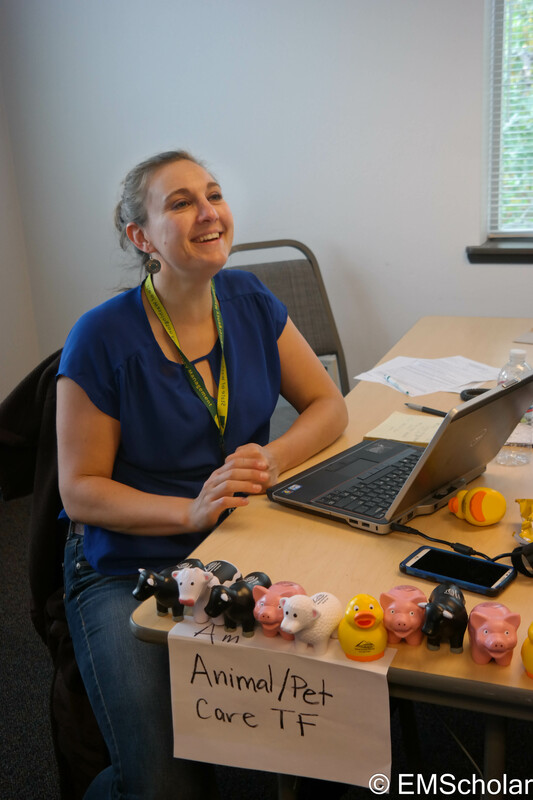 The mass care workforce includes people who help displaced livestock and pets. The National Guard supports the state with vehicles and manpower. Active military prepare to mobilize helicopters, trucks, to help the state find survivors and clear roads. 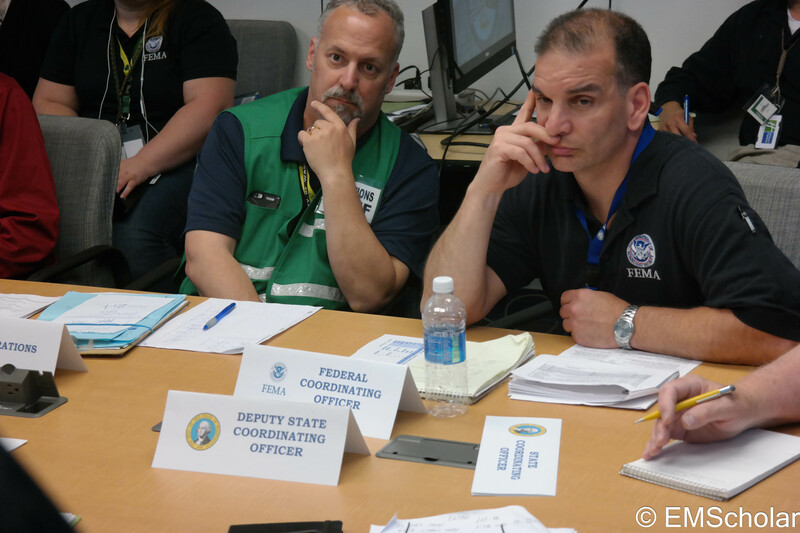 FEMA personnel support state work with subject matter experts, funding, and by liaising with the military. The Red Cross personnel help operations staff set up mass care shelters. 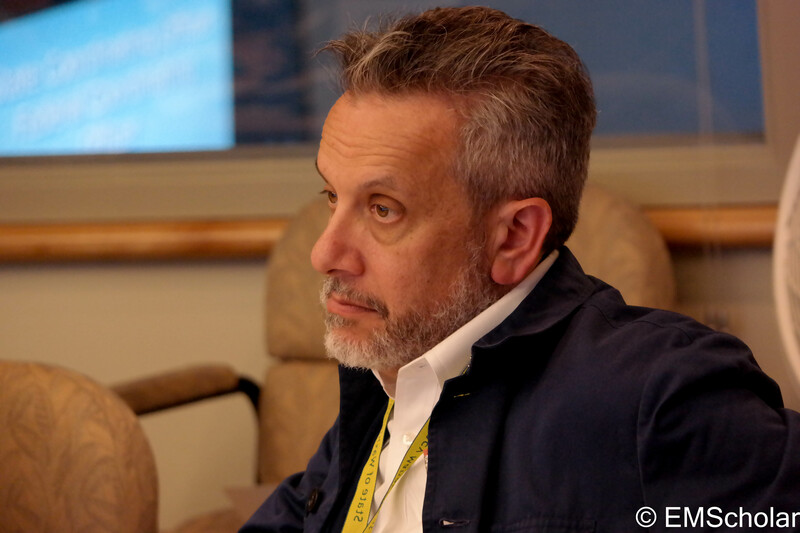 David Postman, Governor’s Chief of Staff, receives regular briefings. 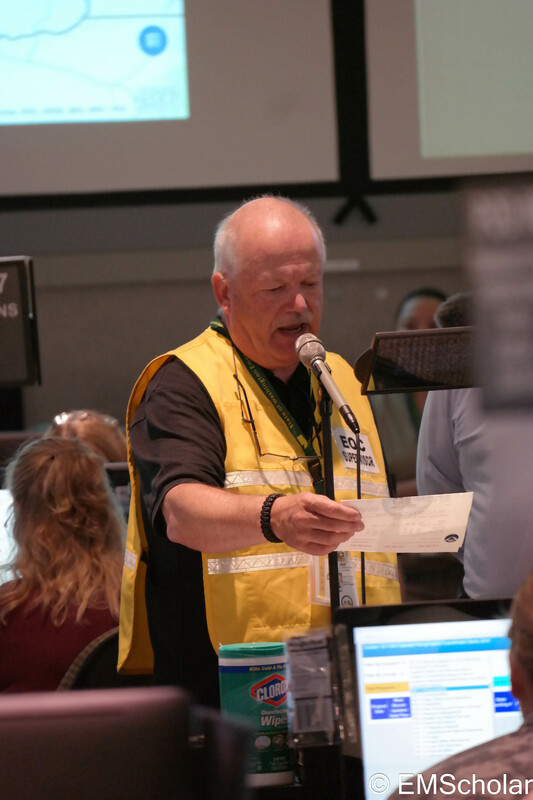 The Emergency Management Director sets response priorities and directs resources. Governor’s Policy Advisor on public safety, Jim Baumgart weighs in. 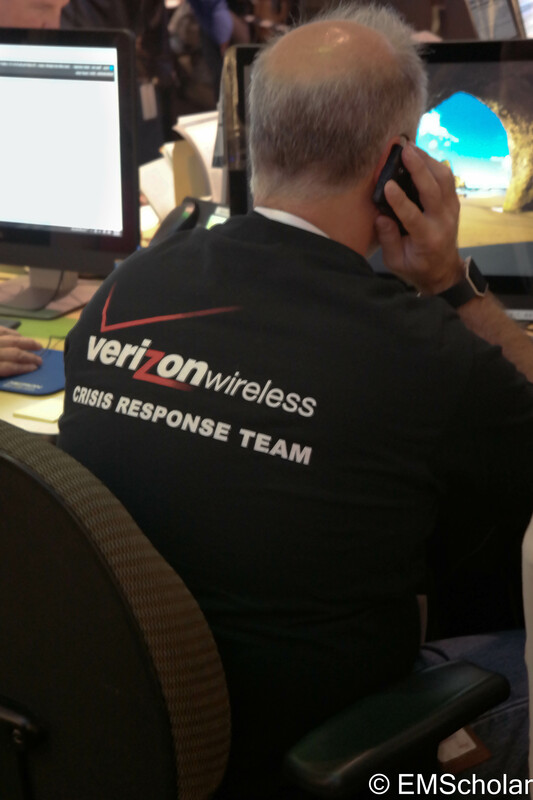 Chris liaises with state legislature to keep them up to date on the disaster response. 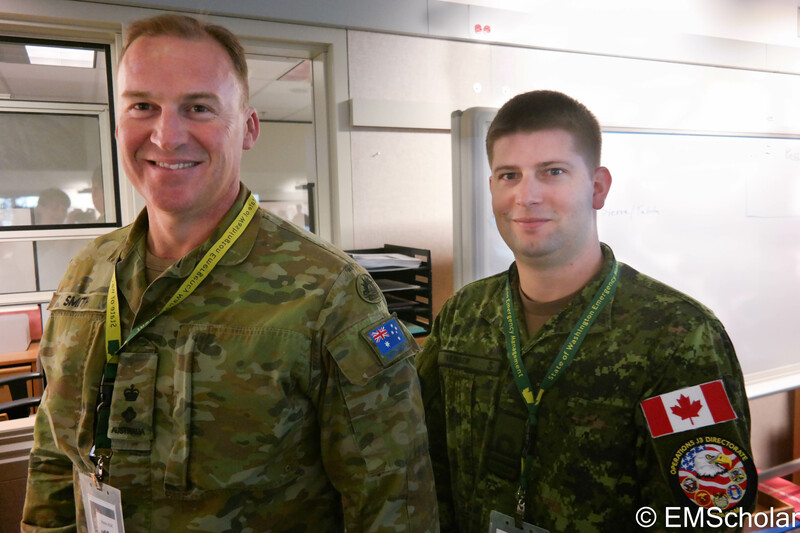 Observers from Pacific Command are here to see how Pacific Command interfaces with state and federal agencies. 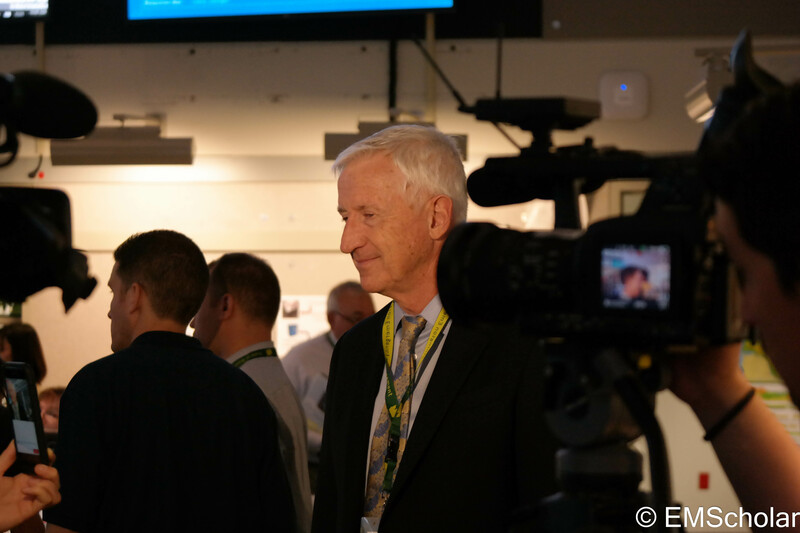 Lit Dudley, Controller and Evaluator Lead talks to the media about how the exercise is administered. Evaluators track the functioning of the players in the exercise and make recommendations for improvements. 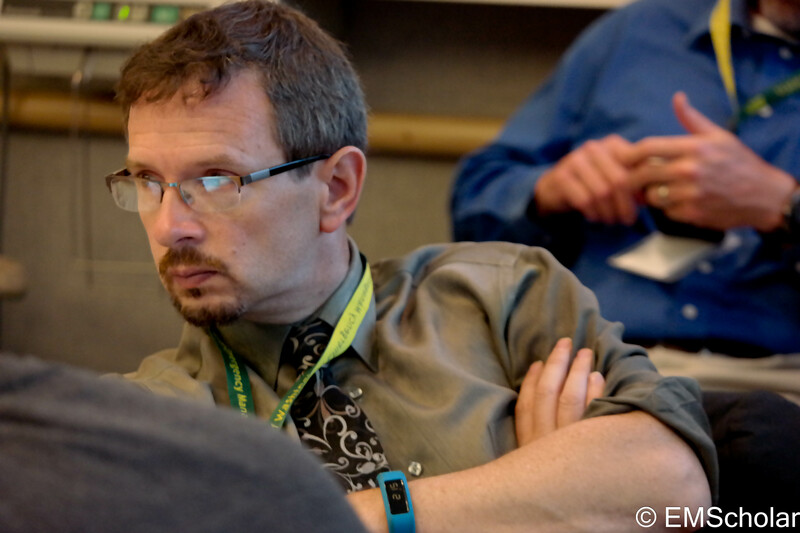 Observers from University of Washington and other states or agencies study the exercise for ideas to take back to their own agencies. 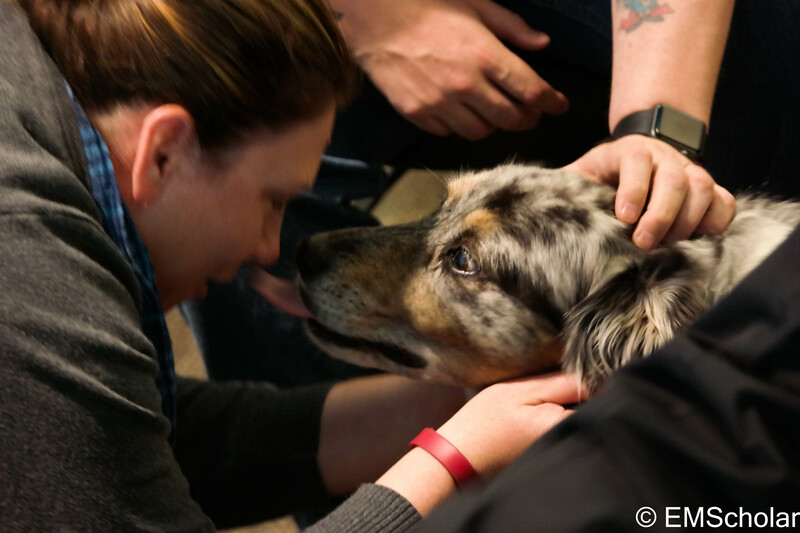 Therapy dogs visit to bring a smile to victims and responders alike (profile in future blog). Emergency Management Division staff provide much needed coffee and food. 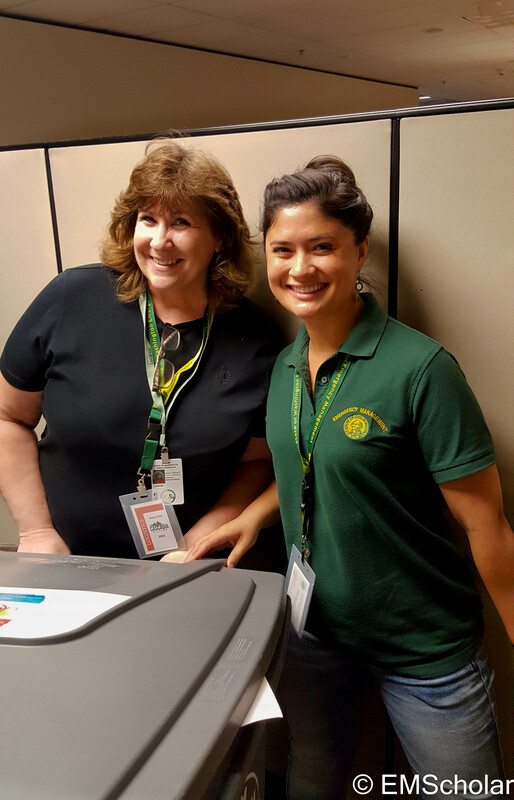 Truly a critical component of the EOC staff! On the other side of I-5, staff at the Venue Control Center monitor exercise activity to see how well we did.